I've said before I wasn't too keen on Sean McKeever's Teen Titans work, but I would definitely read a Ravager series based on his work in Teen Titans: Ravager: Fresh Hell. McKeever's is a pitch-perfect morally-gray action/adventure story in the vein of Deathstroke the Terminator and Manhunter before it; it's assisted mightily by it's role as a co-feature, demonstrating some of the value of that format. 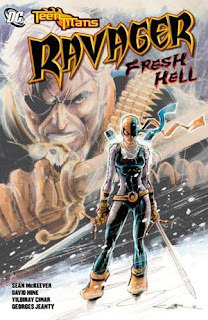 From Fresh Hell's very first flashback of Rose Wilson being drugged by her father Deathstroke to become the assassin Ravager, McKeever offers us a wonderfully complicated take on the title character. Rose Wilson holds much of the appeal to me that Robin Damian Wayne does -- raised by bad guys, the character's only identity is as a fighter, and now she has to find a way to bend her skills for good. McKeever does well tying everything -- including Ravager's quest to save enslaved women -- back to Ravager's dual goals of being as tough as her father without actually becoming him. Along the way, Ravager perhaps fails at being a hero more than she succeeds, leaving a trail of bodies behind her, and that's OK; the sheer joy of this book is in watching the character fail and then struggle to succeed nonetheless. The book starts with the Faces of Evil: Deathstroke special by David Hine, and then one issue of McKeever's Teen Titans that appears in Child's Play before the "Fresh Hell" co-feature stories begin. After the prologue, McKeever moves Ravager swiftly, almost mysteriously, from San Francisco to remote Alaska, where she stumbles into a strange, remote town. The "stranger rides in" approach is straight out of the Westerns, and the fact that neither Ravager nor the reader knows how she arrived to Alaska gives the story a dreamlike quality -- to the end, the reader is never sure if Ravager is actually committing all the heroism and mayhem that she does, or if it's just another of her drug-induced illusions. Fresh Hell was absolutely the right story for DC to release as a 10-page co-feature. McKeever seems to have no problem packing just the right amount of content into each chapter, neither omitting details nor ever seeming rushes; the single-page flashbacks are a good example of just the right amount of storytelling. Indeed, a cliffhanger every ten pages makes Fresh Hell seem peppier, with Ravager always moving and always in danger; I think it benefited this as an action story overall. As I mentioned in my review of Blue Beetle: Black and Blue, it's a shame DC Comics can't "draw the line at $2.99" and continue with these co-features, as I think they open ways of storytelling we don't normally see in the DC Universe. I've been on the fence whether the Faces of Evil: Deathstroke issue ought have been collected here or in Outsiders: The Deep. I still say the latter, because Deathstroke's actions have a more direct effect on the Outsiders (and collecting DC Universe: Last Will and Testament there wouldn't have been such a bad idea either), but I see the reasoning behind having it here, too. The Faces of Evil special includes a prominent appearance by Ravager, though frankly it ties in more with the two-part Blackest Night crossover that also includes Ravager at the end of Teen Titans: Child's Play than it does with Fresh Hell; the present book could have been just as easily understood (if not be as thick) without the Deathstroke special. Overall, however, I think Sean McKeever has a victory here with Teen Titans: Ravager: Fresh Hell. The scene where Ravager spares a villain's life, and then returns later to kill him, is remarkably powerful, reminiscent of Greg Rucka's work on Batman/Huntress: Cry for Blood, too. I hadn't seen much art by Yildiray Cinar before now, but it's exactly right for this story, clear and level like Joe Bennett or Dan Jurgens; Georges Jeanty brings a lot of emotion to the Deathstroke special, too. Perhaps the only drawback is that this marks the seeming end of McKeever's work on Ravager, and not the beginning of something more; it's up in the air whether new Teen Titans writer J. T. Krul will ever do something more with Ravager's adventures here. If not, some may want to pass over this book as "non-essential," but I enjoyed it very much.